What we think is a contributor to company performance is often just an attribute based on this performance. We look at failed/successful companies and deduce that certain behaviours caused this inevitable result. The author takes a close look at Lego, Cisco and ABB at various time periods, and finds that when the going is good, all sorts of attributes are offered (in the media, in books etc.) as explanations for why the company is successful. When business turns sour, however, all of a sudden new attributes are found to explain poor performance. Causal explanations are exclaimed after-the-fact, but there is no evidence of any causal link presented! An example of this in politics can be seen with presidential approval ratings. After September 11th 2001, George Bush's overall approval rating rose, but along with it so did the approval rating of his economic policies (60%). Following the Iraq War and Hurricane Katrina events, his overall rating fell, and along with it so did the approval rating of his economic policies (37%)! Did his economic policies even change? 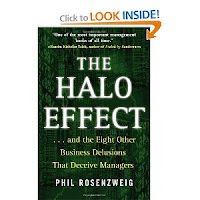 Rosenzweig criticizes a number of publications on the topic of business that fall prey to this delusion, including Fortune's Most Admired Companies and the popular book Authentic Leadership.